President Bush reassured Americans this week that he has not lost sight of the reason that the US went into Iraq more than two years ago: to defend traditional marriage in that country. Mr. Bush articulated a clear strategy for attaining that goal, including an amendment to the Iraqi constitution that will define marriage as a union between one man and one woman. 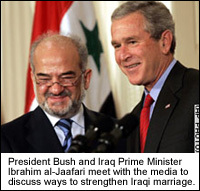 WASHINGTON, DC--It has been more than two years since US forces invaded Iraq, and a full year has passed since the US officially handed over sovereignty to the new Iraqi government, yet the Bush Administration's goal of defending traditional marriage in that country remains unrealized. This week, facing sinking poll numbers and questions from his own conservative base about his commitment to the defense of marriage in the Middle East, Mr. Bush fought back. For the first time, Mr. Bush articulated a clear strategy for defending marriage in Iraq, including an amendment to the Iraqi constitution that will define marriage as a union between one Iraqi man and one Iraqi woman. A committee made up of Shiites, Sunnis, and Kurds has been deadlocked for months on the question of how to word the amendment intended to protect and defend marriage and whether to allow civil unions or other partnership arrangements. A draft of the document must be made public on August 15. For pro-marriage activist Sandy Slokum, executive director of Defend Our Marriages, an Arlington, VA advocacy group, the President's reassuring words came at exactly the right time. Mrs. Slokum recently returned from a trip to Fallujah where she has been advising Defend Fallujah Marriage, a grassroots organization in the Central Iraqi city that is using lobbying and other pressure tactics to sway members of the new Iraqi government in favor of the marriage amendment. "This is just such great news," says Mrs. Slokum. "As I travel around Iraq, I hear over and over again from people that defending traditional marriage is what matters most to them. They look at Belgium and Norway and they are scared to death that that's what the future holds for Iraq—a future in which marriage is meaningless." But even Mr. Bush's most ardent supporters—and the loudest defenders of his decision to use force to defend traditional marriage in Iraq—warn that the road ahead is likely to be a long one. For one thing, the transition from a secular culture to a theocracy is proving no easier in Iraq than it is here at home. For now, President Bush seems to have appeased his most important critics: the conservative Christian base so important in his recent reelection, and for whom nothing short of a victory for traditional marriage in Iraq will do. But those critics are unlikely to stay silent for long. Pro-family organizations are already preparing for a bitter battle over the replacement for Iraq's top judge, Chief Investigative Judge Raid Juhi, expected to step down later this summer. Their top choice: a conservative religious candidate who will finally breach the separation between church and state once and for all. "For so many years, God was basically banished from the public square here," says Sandy Slokum. "Now we finally have a chance to undo some of that damage." 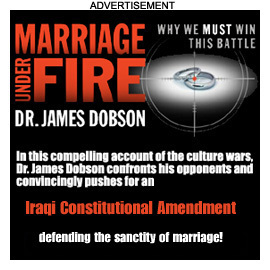 Well, there will need to be some updating of traditional marriage for Iraq, especially in Fallujah. I assume Sandy Slocum, having been in Fallujah, is aware of the vast increase in dead and and injured as opposed to live Iraqis there. Does she have a position on the adviseability/legality of marriage of a healthy-ish Iraqi to an Iraqi maimed/mutilated by US bombs, US chemical weapons, trigger-happy US soldiers, etc? What about the sanctity of marriage between a healthy-ish Iraqi to one whose gender has been rendered indeterminate by US chemical weapons? Surely she's developing a position on these questions. By fighting for marriage in Iraq, we won't have to fight for it at home. Yay! Long live all marriage! A marriage should be defined as a holy union between two sentient beings of biological origin as clearly stated in the Brand New Testament of 2160. It is an outrage to suggest that a relationship between a humanoid and an android can be normal and in any way productive. A marriage should be between a man and his women. Just like in the Old Testament. Will Iraqis be allowed to marry Americans ? As I understand it, the Iraqi Constitution will actually define marriage as between "One Iraqi man and one or more Iraqi women." A press release from the Church of the Later Days saints has expressed strong support for defense of such traditional marriages in Iraq and in America. Don't you be making fun of foreigners. We Judaeo-Christonian people take no back seat when it comes to respecting farm animal relationships. Goats are good, but most Midwestern farmers would tell you that sheep are better partners. Glad to see the President extending his marriage agenda to faraway lands ... but my question is, how does he plan on keeping Kurds from marrying Sunnis, or Shiites marrying Kurds? Mixing the races, as we all know, is against God's will. Marriage is sacred, to be sure, but if we allow intra-sect marriages in Iraq, next thing you know - Iraqis will be free to marry their goats.